Candy Games em destaque na BlackBerry World :D.
Jogos doces em destaque na BlackBerry World :D.
* Candy Slash Story –> Grátis. * Jelly Cats –> Grátis. * Candy Rush FREE –> Grátis. * Candy Island HD – FREEmium –> Grátis. * Free Candy World 3 –> Grátis. * Candy Shape Crunch –> Grátis. * FREE Candy World –> Grátis. * Candy Bounce Free –> Grátis. * Candy Fruit FREE –> Grátis. * Candy Fall –> Grátis. 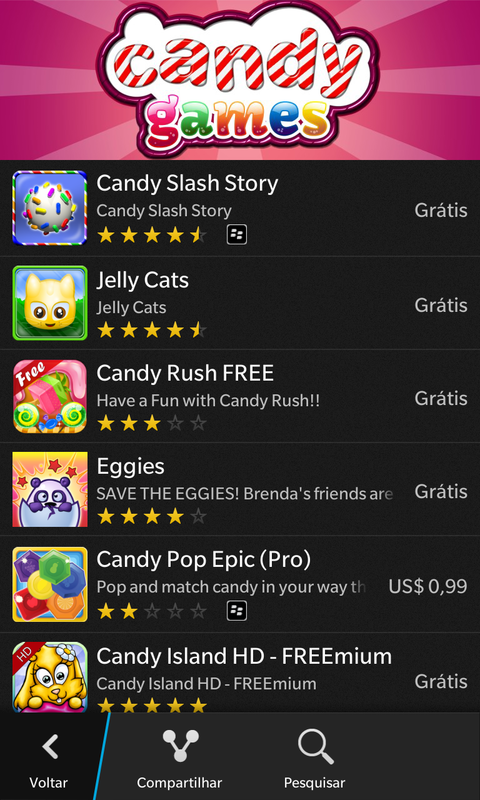 * Candy Blast Free for BlackBerry –> Grátis. * Fruit Crusher Free for BlackBerry –> Grátis. * Fruit Fever –> Grátis. * Candy Rows –> Grátis. * Candy Creek –> Grátis. * Catch the Candy –> Grátis. * Fruit Slash – Fruit Crush Free –> Grátis. Anterior Post anterior: Fornecedores de software de navegação estão fechando parceria com a QNX :D.
Avançar Próximo post: Smartwatch da SpeedUp terá conexão com o BBM :D.